DaimlerChrysler has refused to bail out Mitsubishi Motors, the loss-making Japanese carmaker in which it holds a 37% stake. Debt-ridden Mitsubishi Motors has been talking to shareholders about a 700bn yen (£3.6bn; $6.4bn) survival plan. Japan's transport minister has called the decision "a serious matter". DaimlerChrysler's chief financial officer said on Friday it might sell off its stake in the Japanese firm but no decision has yet been taken. Mitsubishi - Japan's only unprofitable carmaker - has seen declining US sales and scandals relating to the recall of vehicles in the US and Japan. Three other Mitsubishi Group firms with a 23% share of the automaker between them have said they would "do our utmost" to continue to support it. It has racked up debts of 1.14 trillion yen, which it hopes to plug through the fundraising plan. "It was decided not to participate in a capital increase as was planned by Mitsubishi Motors, and that means that DaimlerChrysler will cease to further financially support Mitsubishi Motors," a spokesman for the US-German group told the BBC's World Business Report. DaimlerChrysler's stake in Mitsubishi has been seen as central to it Asian expansion plans. Chief financial officer Manfred Gentz told a news conference that projects already agreed between the two firms would go ahead. He said the 37% shareholding was not currently on the market, though the firm may reclassify the shareholding in its accounts as discontinued business. Japan's finance minister, Nobuteru Ishihara, has said DaimlerChrysler's decision "could affect the future of the company", and industry minister Shoichi Nakagawa has pledged "to carefully monitor the situation". "This is a disaster for Mitsubishi Motors," said Koji Endo, a motor industry analyst at Credit Suisse First Boston in Tokyo. "The company will vanish if it continues this way," he said. Mitsubishi Motors' shares were suspended in Tokyo on Friday morning after plummeting 25% to 241 yen. 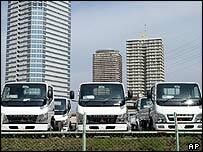 Mitsubishi has already warned that it expects to post a net loss of about 72bn yen for the year to 31 March. Analysts said any survival plan would involve scaling down its activities. Mitsubishi has been seeking the support of its shareholders for its fundraising plan in the run up to its 30 April shareholder meeting. Some of its woes stem from an unsuccessful strategy of offering easy car loans in the US, which backfired when many customers failed to pay them back. It has also been dogged by product recalls and scandals over faulty goods. On 9 April this year it announced the recall of 81,531 cars for faulty wheels. In 2000 it confessed to failing to inform authorities about 64,000 customer complaints about faulty vehicles going back to 1977. "We asked Mitsubishi to come up with a business plan."